When designing and installing a piping system for liquid service in industrial or commercial applications, the location and type of valve selected for process control plays a major role in whether the valve will operate smoothly or if it may experience cavitation or choked flow. These severe operating conditions may not only damage the valve and increase maintenance costs, they could also create safety hazards for the plant personnel. In addition, the severe conditions may impact the ability of the process to deliver the liquid at a designed flow rate, pressure, temperature or other quality parameter. 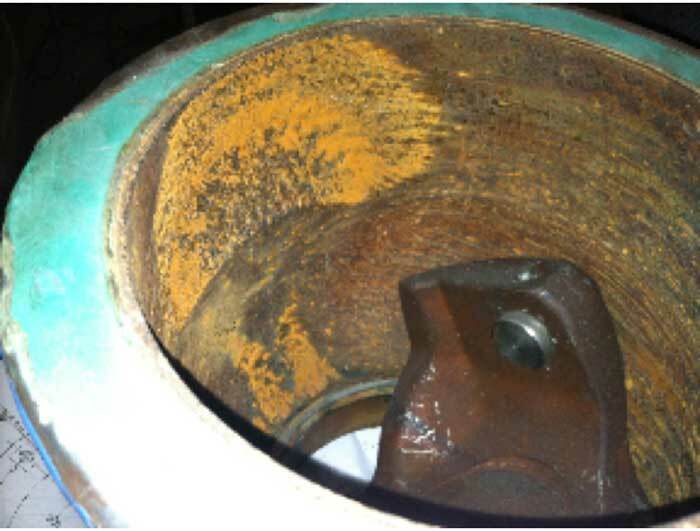 Cavitation and choked flow conditions are difficult to recognize and can occur in any piping system. However, with a piping system model, a problem such as choked flow can easily be identified and solutions evaluated in the model prior to implementation. High temperature and high pressure drop applications make the valve more susceptible to cavitation and choked flow. Installing the valve at high elevations in the system where the inlet pressure of the valve is low may cause cavitation, which is unlikely if the valve is installed at a lower elevation. The type of valve selected also plays a role in determining whether the valve will operate with cavitation present or if the choked flow rate is reached. Cavitation is a condition that occurs when the pressure drop across a valve causes the fluid’s static pressure to drop to the vapor pressure and the liquid flashes into vapor bubbles. The area with the smallest flow passage in the valve, or the vena contracta, is the most susceptible location for cavitation to begin. This is the point of highest velocity and lowest pressure (Bernoulli principle in action). 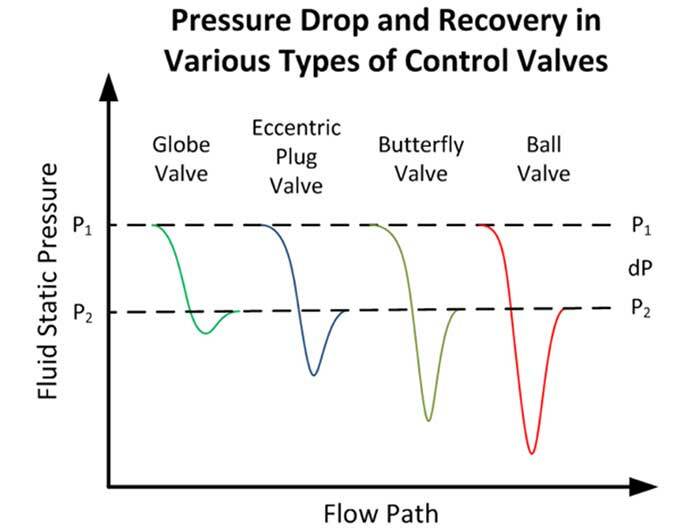 When the flow passage downstream of the vena contracta expands, some pressure recovery occurs as the fluid velocity decreases and pressure increases before it leaves the valve body. If the pressure increases above vapor pressure, the vapor bubbles collapse and implode on internal surfaces of the valve, damaging the material with each implosion. This causes high noise levels, vibration, pipe stress and pitting of the valve’s internal surfaces and even downstream piping, as seen in Image 1. The cavitation damage increases as the pressure drop across the valve increases and more liquid is flashed to vapor at the vena contracta. If the pressure drop across the valve is high enough, the flow passage at the vena contracta becomes fully occupied by vapor and choked flow occurs. The flow rate at choked conditions reaches the maximum flow that can be achieved for the given inlet conditions and cannot be increased regardless of how much the pressure drop across the valve is increased. When cavitation occurs in a control valve, the actual flow rate begins to deviate from what is predicted using the flow coefficient equation presented in the ISA standard for sizing control valves S75.01 (IEC 60534-2-1 equivalent). This is a result of the vapor bubbles occupying more volume as the mass of liquid expands during the phase change, creating an additional resistance to flow. 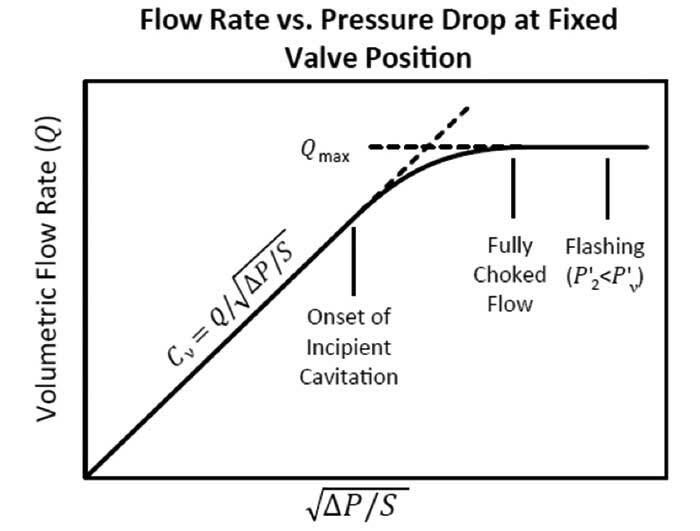 As seen in Image 2, for a given valve position and flow coefficient (Cv), the valve’s performance begins to deviate from the linear relationship at the onset of incipient cavitation. If the flow rate or pressure drop required for the application is greater than the choked values, then the required flow or pressure drop will not be achieved, and the valve will be exposed to these extreme conditions. The liquid pressure recovery factor (FL) is an important characteristic of a control valve that roughly indicates how much pressure drop occurs across the valve compared to the pressure drop from the inlet to the vena contracta. Some types of valves, such as ball and butterfly valves, have a low FL in the range of 0.55 to 0.7. Globe valves, on the other hand, have a high FL in the range of 0.85 to 0.9. This important piece of control valve data is determined with testing by the valve manufacturer and should be provided to the user along with other critical valve data. A software simulating the system should display a warning when the conditions for choked flow are met. Consider the piping system modeled in Image 4. Cold water at 60 F is pumped to a heat exchanger and heated to 180 F. The flow rate is controlled by a globe valve type of flow control valve located at 30 feet of elevation.